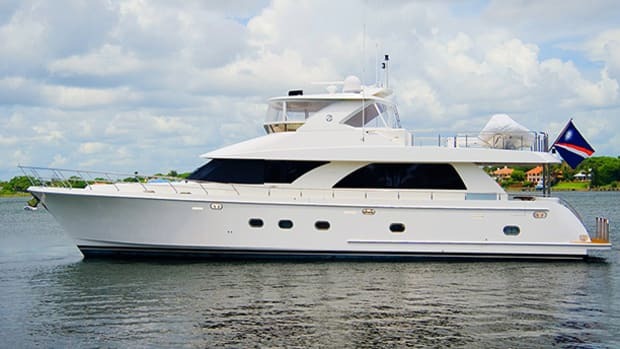 Falling in love with a yacht custom made for another owner isn’t too difficult when it’s from a renowned builder. 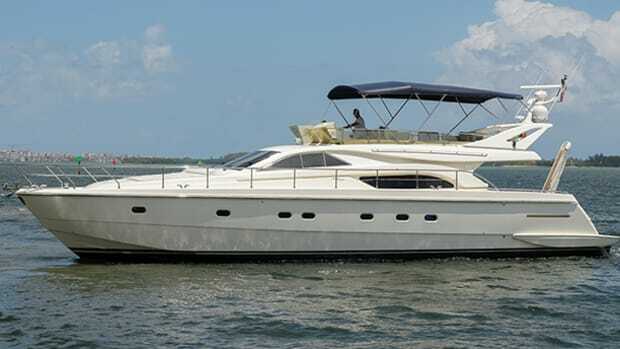 Imagine for a moment that you’re scanning the brokerage listings for a custom aluminum cruiser, and you come across the 72-foot express cruiser Valkyrie, a 1988 build. 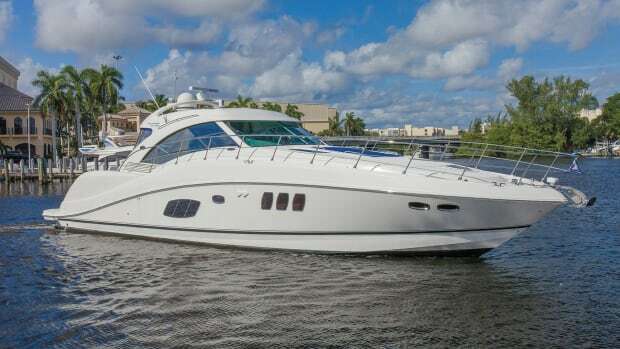 Scanning the pictures, you admire the classic raised pilothouse profile that hearkens back to the commuter yachts of New York and Long Island Sound. And then you discover that this design is from the board of C. Raymond Hunt, master of the rough-water-taming deep-V hull, built by Burger Boats, the Midwestern yard that fairly defines royalty in American custom aluminum yacht construction. It is safe to say that you pick up the phone to speak to a broker, knowing as you do the Burger Boats legend. When Henry Burger apprenticed to Wolf & Davidson Shipyard in Milwaukee, Wisconsin, in 1857, he could hardly have imagined that he would found a shipbuilding dynasty that carries his family name to this day. The business began in Manitowoc, just 80 miles north of Milwaukee, and would become known as a preeminent builder of wooden sailing and power vessels for commercial and recreational use. Some years later, his son, Henry Jr., oversaw the building of wooden cruisers that were known for their use of then-innovative technologies, like gasoline engines, in luxurious custom yachts, as well as for the company’s continuing reputation for quality and craftsmanship. Following World War I, the company adopted electric arc welding and steel hulls became a Burger specialty. Working with the Reynolds family, of Reynolds Metals Company in 1952, and incorporating the new specialty MIG and TIG welding techniques, Burger began building power and sailing vessels in aluminum. Although not as strong as steel, aluminum yachts are stiff and light, achieving operating efficiencies steel vessels cannot realize. Properly engineered and constructed, and regularly maintained, yachts built of these materials have proved to be long-lived, and very popular with well-heeled yachtsmen. Designs from the boards of the naval architecture and marine engineering firms—Sparkman & Stephens, J. B. Hargrave, and C. Raymond Hunt—found their way to Manitowoc to begin careers. 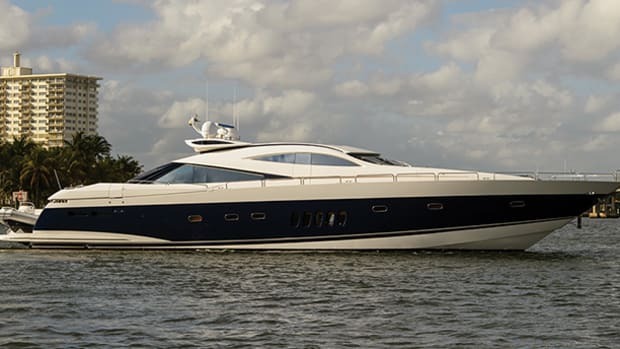 Today, designers like Cor D. Rover, Andrew Winch, and Luiz de Basto have been involved with Burger’s in-house designers and engineers, to produce yachts ranging up to a 214-foot trideck motoryacht. Tasteful layouts and smartly designed living spaces lend longevity to Valkyrie’s interior. 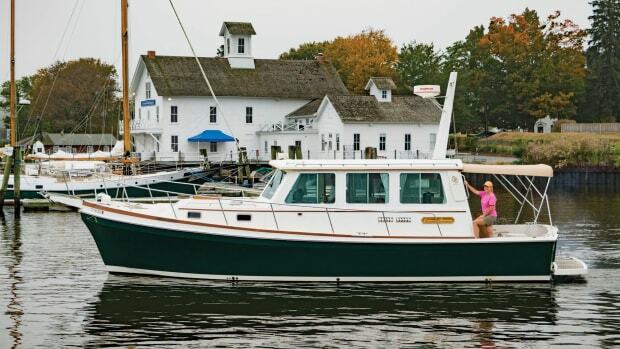 Valkyrie is hull number 466, and was originally named Medora and owned by Ireland Yacht Sales. There are two guest staterooms forward and an owner’s stateroom aft, all with en suite head compartments. The interior finish is Herreshoff-style, with white painted panels throughout, trimmed everywhere in stunning teak. Teak locker and drawer fronts contrast nicely with this finish, as does custom cabinetry. The owner’s stateroom is notable for its walk-around queen berth, its custom ­birdseye maple and teak wash basin, its abundant stowage—a nine-drawer dresser and walk-in cedar-lined wardrobe for starters—a large desk, and private access to a spacious aft cockpit with built-in seating and room for more folding chairs. Twin teak overhead grab rails are positioned to make moving around in a seaway safer. A bimini shades the cockpit, which is undoubtedly a fine place to relax in any beautiful anchorage. A new teak-planked sole graces the main saloon (also the galley and the pilothouse), which is forward of the owner’s stateroom and up four steps. There’s seating for six at the starboard side settee, with two loose teak chairs and a large, hi-lo table. A pair of easy chairs upholstered in leather flank a locker to port. Custom cabinetry abounds, so stowage is well thought out, including an entertainment cabinet on the forward bulkhead. Large side windows provide plenty of natural light and views of surrounding scenes. Another pair of teak searails overhead run the length of the saloon for safety when moving around underway. The galley is slightly forward of amidships, and down a short flight of stairs from the saloon, beneath the pilothouse. Stainless steel countertops and a deep stainless sink are prominent, with cupboards above and drawers below. A teak-fronted shelf outboard of the sink provides quick access to oft-used items. 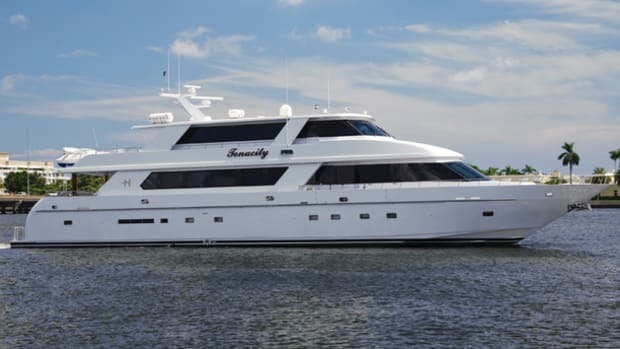 The galley is fitted with top-flight appliances—Fisher & Paykel fridge, GE convection microwave, GE full-size oven, KitchenAid induction cooktop—and is adjacent (going forward) to a laundry/sitting room that houses a Whirlpool stacked washer/dryer. Engine room access is through a side deck entrance, or through a hatch leading down from the main saloon. Valkyrie is driven by a pair of 760-horsepower MAN D2842LE V12 diesels, and is said to achieve a cruising speed of 18 knots and a top speed of 20 knots. Her engine room, which also houses twin 40-kilowatt John Deere industrial gensets, is a beautiful example of careful engineering and installation. 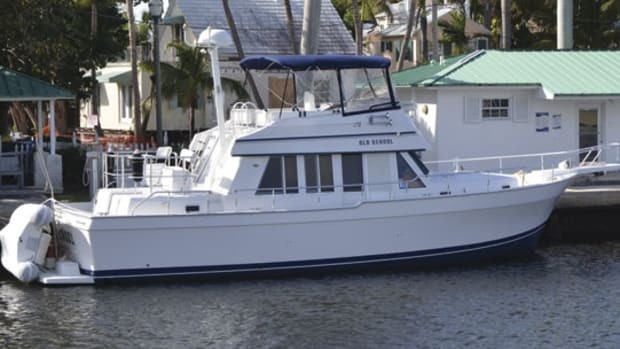 With a 2,500-gallon fuel capacity and 700-gallon freshwater capacity, she is meant to cruise long distances. Four steps up from the saloon, via a port side stairway, the raised pilothouse commands clear views forward and to both sides. 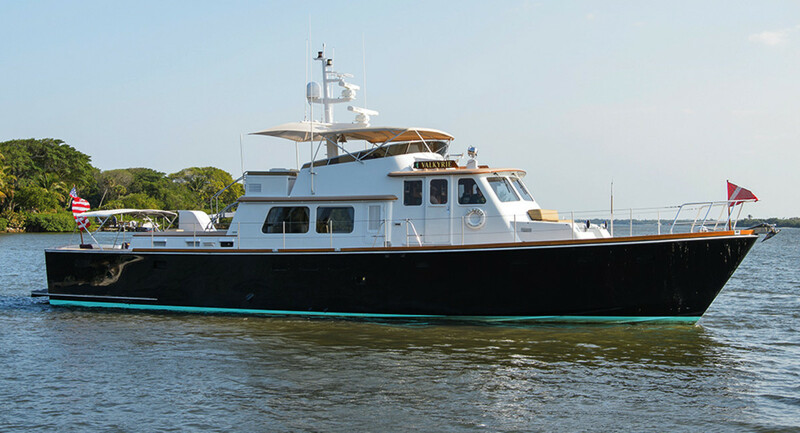 Paneled in beautiful teak, it features sliding doors to the side decks both port and starboard, an upholstered leather bench seat centerline on the bulkhead aft, and a flight of steps to starboard giving quick access to the flybridge. In a nod to traditional yachting etiquette, there is signal flag stowage recessed into the aft bulkhead just above the bench, which has drawers below. This is one of the most beautiful, functional pilothouse bridges I’ve ever inspected. A single Stidd helm chair in black leather fronts the helm console, which is entirely constructed in teak, and is furnished with a teak-rimmed, stainless steel destroyer-style wheel. To port, there is a nav table flat with large chart drawers beneath. To starboard, there is another large counter area, beneath which are a pair of ship’s systems switching panels. Twin-lever Panish engine controls are located to starboard of the wheel, a single-lever joystick for the HPS/Naiad 12 bow thruster is to port of the wheel, and the NSS8 Simrad touchscreen MFD (replicated on the flybridge) is directly ahead of the wheel—ganging all of the navigation and maneuvering essentials within easy reach of the helmsman. Wide and walkable side decks, thigh-high stanchions and hidden handrails under the saloon roof overhang mark Valkyrie as a yacht well designed for safety. Line handlers will be able to move fore and aft with ease, and there’s plenty of obstruction-free deck space forward for anchoring duties. A crane sits port side atop the master stateroom roof, with plenty of space for the dinghy. 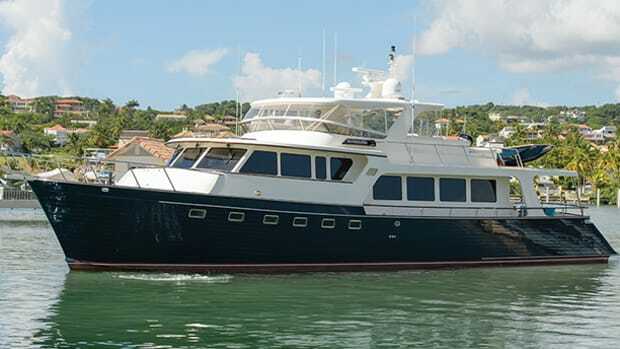 A teak and stainless steel ladder, a set of steps really, curves up from the roof to the flybridge, an alternate access to the stairs in the pilothouse. Twin Stidd helm chairs face a forward helm console on the flybridge, which is equipped with controls that duplicate those on the lower helm. 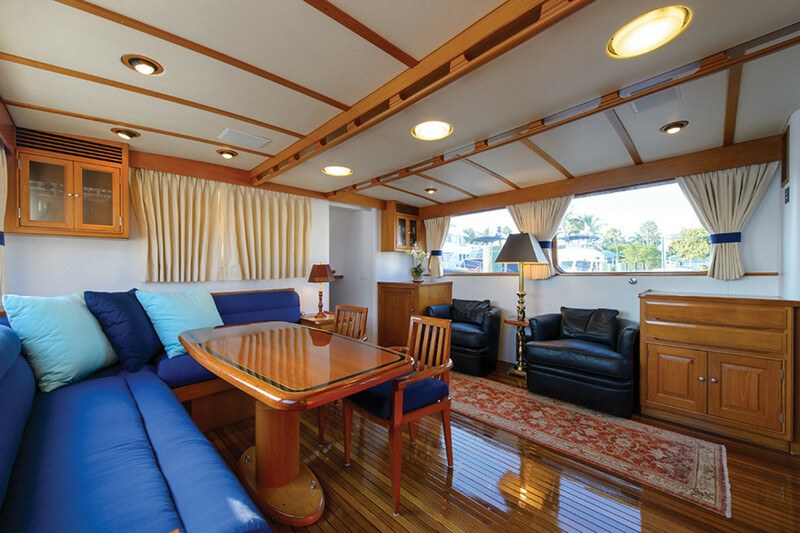 Built-in bench seating to starboard, as well as a large dinette/lounge with facing benches, provide seating for a crowd of guests. The electronics mast is host to two open-array radar antennas, part of a comprehensive $53,000 Simrad Network refit in 2014, and is hinged for passing under low fixed bridges. It goes without saying that a yacht like Valkyrie requires a thorough, specialized survey prior to purchase. Ultrasound diagnostic equipment can help identify problem areas, as well as good ones. 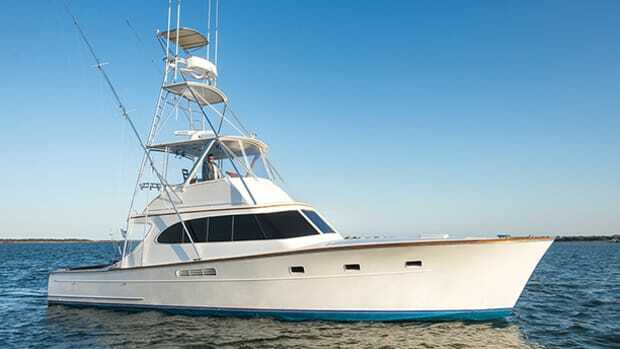 Valkyrie underwent a $1 million refit between 2012 and 2014, an indication that the previous owner appreciated well the lineage, and the importance, of owning a Burger.